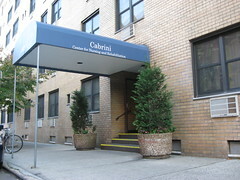 Stephen Rex Brown The Cabrini Center. This week, dozens of residents and employees of the Cabrini Center for Nursing and Rehabilitation will receive bottles of holy water with which to bless their new homes or offices. The bottles are a parting gift to the 85 remaining residents of the nursing home at Fifth Street and Avenue B who will have to vacate by July 1 so that the building’s new owner, Benjamin Shaoul’s Magnum Realty Group, can go ahead with redevelopment plans.